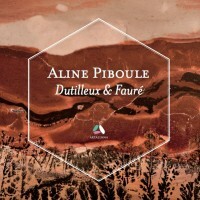 Noted for artistic qualities that combine powerful energy with extreme sensitivity, Aline Piboule defends the entire pianistic repertoire ranging from Bach to the composers of today with equal conviction. A recipient of numerous distinctions, she was awarded 5 prizes at the Orleans International Piano Competition 2014. She is regularly invited on the French radio station, France Musique, on programmes presented by Philippe Cassard, Frédéric Lodéon, Gaëlle Le Gallic, Stéphane Goldet, and Lionel Esparza. Her first solo album, released in april 2017 on the Artalinna label, is devoted to the French composers Gabriel Fauré and Henri Dutilleux. It received great acclaim by critics (4 F Télérama, 5 Diapasons, 4* Classica, Selection Le Monde…). As part of her endeavour to share with upcoming generations, Aline Piboule has collaborated with les Jeunesses Musicales France to design a recital for young listeners that grants a first encounter with the piano repertoire ranging from Chopin to present works. In parallel to her career as a soloist, Aline Piboule, passionate about chamber music, has performed with internationnaly renowned artists. 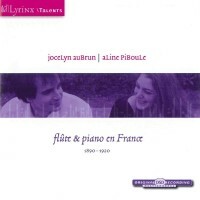 Aline Piboule studied at the CNSMD in Lyon (obtaining her diploma with the highest distinction), at the Conservatoire Supérieur in Paris (Postgrad studies) and was in the class of Jean Saulnier at the University of Montreal. She was sponsored by the Mécénat Société Générale, ADAMI, SACEM. Aline Piboule offers us a journey to the country of light. For her first solo album, she brings together three fundamental French piano works, Faure’s Ballade and Theme et variations and Dutilleux’s Sonata, wich has become one of her favourite pieces. The programme is made up of a succession of insistent variations on the theme of light, contrasting aesthetics wich very often oscillate between shadows, sound and silences. Aline Piboule’s playing has a fairly typical Frnch charm, fluctuating between robustness and tender sensuality. 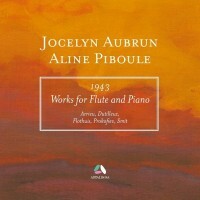 For their second album as a duo, the flautist Jocelyn Aubrun and pianist Aline Piboule decided to bring together five works composed in 1943. A rainbow journey around Europe, from France to Russia via the Netherlands. Alongside the oft-celebrated Prokofiev and Dutilleux Sonatas, this retrospective also offers some little-known works such as Smit’s Sonata, whose style ressembles Hindemith, or that of Flothuis, a sort of pastorale with strong French influences. Another great rarity : Claude Arrieu’s reinvigorating and delightful Sonatine. Prize winner of the programme Déclic/Cultures France (French institute) for the promotion of young French artists abroad. International Competition “Città di Padova” (Italy), tied 2d prize (no first prize). First prize unanimously, Conservatoire National Supérieur de Musique et de Danse de Lyon.